Paying Ready Attention: Intentionally West. A day after unpacking I repack. Less pairs of shorts, no sandals and four shirts as dress as my wardrobe allows. It’s work rather than a holiday. But I still shoehorn my camera gear into the same bag as last week, hoping that a luggage fascist is not on duty at the airport. Normally the elephantine size of other people’s hand baggage gives me a degree of moral leverage if objections are raised. Boarding a plane with telescope or a long lens draws suspicious glances and muffled accusations of espionage, but a double stack package of Crispy Kreme donuts, with special requests for sensitive handling and a personal overhead locker does not raise an eyebrow. I have to laugh, as I am no more likely to be a spy than the donuts are to be real food. Of all the things I have seen brought on to a planes, the donuts seem to be the most wilfully strange. Maybe their owners have just watched Alive, and have brought stores for a few months of hardship. I pass the time on the plane with a film in which two Australians and Elizabeth Bennet seem to be hunting Osama Bin Laden. Although I admit I could be wrong. Our host greets us at the door. She shows us to our rooms and pales slightly at the time at which we need breakfast. Down by the sea the upper sky turns dark blue while the horizon is lit by the afterglow of sunset. A horizon bright with the light of a sunken Sun grows dark with height, until it sinks to the full black of a spangled night sky. Surfers slide on the last of the evening’s waves, dull patches in the pale glow. People run. People walk. Bare torsos and expansive tattoos compete for attention with slowly driven cars. A couple from Lancashire drink dark thermos tea and mention that never in the 40 years since they arrived have they left Western Australia. Welcome to Perth. Welcome to a different Australia. Even by Australian standards Perth is a long way from anywhere except Fremantle. Sitting out on its own, away from the populous east coast, away from the seat of Federal Government, it would have taken very few changes of history for it to have become the capital of its own country. As it is, there is an uneasy truce between the west and the rest. Both benefit from the presence of the other, although neither seems brave enough admit to this. But the difference I’m interested in does not lie in the roots of history or in the per capita contribution to the economy - it lies in the biology. If you look at an Australian bird book you will soon notice a cluster of birds that only occur in the south west of Western Australia. Little patches of colour on an otherwise empty map. It’s these birds I hope to see. Just over the road and through a screen of trees, a lake has tempted me all week. In the early morning drive into work I could see pelicans and other smaller, more mysterious birds, floating on the water. But the morning commute waits for no man, birder or not, so I never got more than a few tantalising glimpses. It was clear that there were plenty of birds there, but an eye’s corner view is never enough. So, on the last day, in the dead time between the end of work and the time to go to the airport, I impose on my workmates to try a spot of birding. They were tolerant, if not necessarily enthusiastic, as we pulled up next to Herdsman Lake. Even in the car park (an undervalued habitat in my opinion) there were birds. A Purple Swamp Hen dashed about on the grass, looking for the remains of a school group’s lunch. Far too large and brightly coloured to be inconspicuous it was none the less being ignored by the kids, captured, as they were, in their game of Duck, Duck, Goose. The sight of me with lens and monopod is too much for the Swamp Hen. It charges towards the sanctuary of the water with an exaggerated stride and an exasperated look. 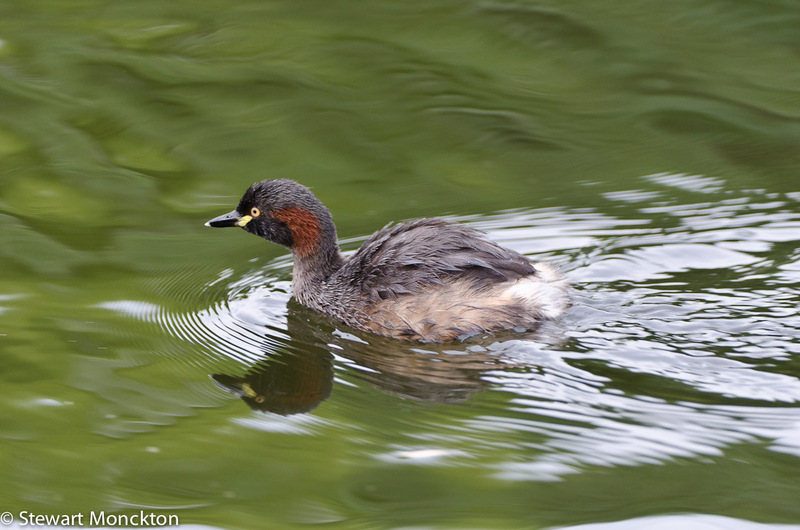 A reed bed just over the water rattles to the sound of the eponymous warbler, coots chase and fight over birdy slights. In the spindly trees, a pair of Nankeen Night Herons – buff red brown, with a black cap and tassel - squabble over who will sit on the highest point. This is an exercise in futility as the uppermost limbs bend and collapse under even their modest weight. Hardhead and Musk duck dive in the shallow water, always coming up where my lens is not pointing. All of these birds were in clear sight – or coming in loud and clear through clear air – so identification was not hard. In the midst of the ducks another bird floated with its head tucked round over its back, under its wing. It looks little more than a fluffy lump, but I think I know what it is. Something angular about the shape, and the indistinct, vague way the rear end of the bird forms, shouted out “grebe”. The combination of long, curved neck and the two-tone colour all point in the same direction. 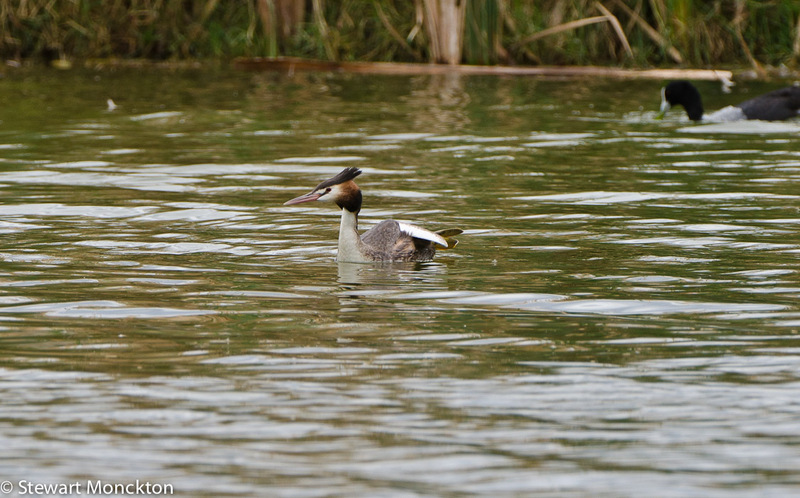 When the bird lifts its head to reveal two long ear crests and an equally long beak, the deal is done – it’s a great crested grebe. Strangely, its lobed feet stick out from behind its body. Small field marks meld together to conjure a sighting from uncertainty. 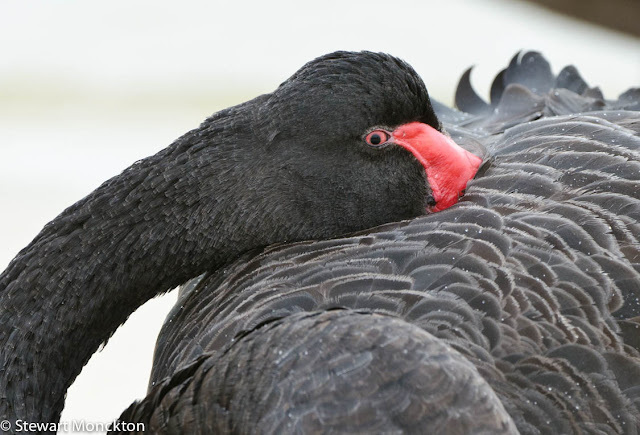 The bird tucks its head and returns to its sleeping position. Across the water, tucked under a broken tree are some small grey ducks. 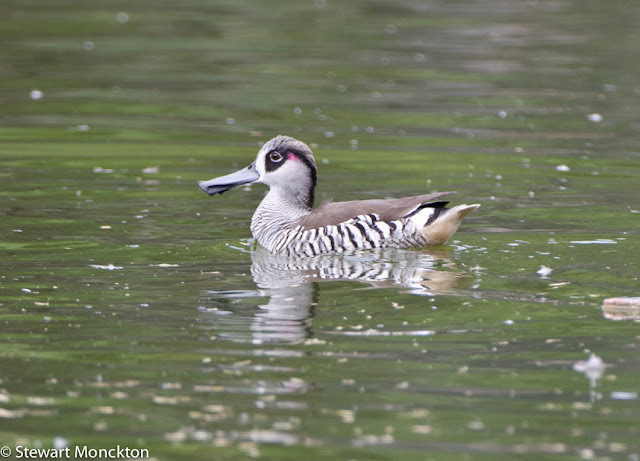 When they shuffle into the water they float low, perhaps denser than most ducks, with zebra striped flanks and an oversized boxy bill. I can’t really see them that well, but I know they are Pink Eared ducks, a delightful little bird I never tire of watching. It’s only through a ‘scope or binoculars that you have any chance of seeing their pink ears. I know the bird without seeing the thing that names it. Later in the day, when I bring up my pictures of these birds on a computer, one of my non-birding companions comments that they look like they have “a pink highlighter pen mark on the side of their head”. This is the kind of description that never makes it into field guides, but is none the less completely accurate. Their remarkable square ended bill goes unremarked upon, their stripes go unnoticed, but the pink ear draws attention. Deservedly so. The features I used to name the bird were overlooked, but the invisible becomes clear to those who look for beauty rather than name. As birders, do we lose sight of the beauty in the birds because we only look at the things that allow us to name that bird? Do I remember the beauty that I find only when it is out of place or unexpected? Whatever the reason for awareness being pricked, it happened that day, by that lake, in those few stolen minutes after lunch. The dull chills of air-conditioned office discussions were swept away by this breath of fresh – if rather humid and warm – air. I could have stayed for a very long time. I think I managed 15 minutes or maybe it was 20. Any breakfast that offers the possibility of chocolate milk and muffins is going to be a battle between opportunity and restraint. The muffins I can do without, but a glass of temptation is a rare luxury. “Miss Maud’s” sounds like it could be a brothel, but it’s not. The place sparkles with Scandinavian themed cleanliness and purity. It may well be pastiche, but it’s good pastiche. I don’t have time for a long breakfast, so I build a bacon sandwich (joy of joys!) and leave. Half way through the sandwich a 4WD pulls up and my guide for the day steps out. He’s a Stuart with a ‘u’ rather than an ‘ew’, a quietly spoken zoo keeper with an eye for birding detail and a wife who cooks a mean nut slice. He has that most valuable of commodity, local knowledge. The day begins with a semi-serious listing of birds we see from the car – magpie lark, silver gull, wattlebirds. But soon we stop when it becomes clear that neither of us is driven by lists alone. We pull up next to a small urban lake – it’s one of the few places in Perth that I’d recognise – and I say “I’ve been here before” – Stuart seems to think I’m identifying a problem, but I’m only stating the truth. A splash in the water distracts us from this conversation. An Australasian grebe and its chess board dappled chick swim close to the shore, acclimatised no doubt by passing cyclists, night time singers and visiting birders. The lake is a rich green, its algal life set to overdrive by the nutrient swill of storm water. Ducks feed in the sticky looking liquid and shake their heads in disapproval as they surface. As we are driving through the morning streets a flock of large black cockatoos dribble in ones and twos from the tops of the street trees. These are Carnaby’s Black Cockatoos, a species restricted to the south west of Western Australia. They have white panels in their tails that flash as they fly. We park illegally, but with clear moral authority, on the pavement and get out to watch. The birds call with crackling voices and swoop low over rooftops and rush hour pedestrians. Nobody seems to be looking upwards. Maybe the birds are too familiar – although I doubt it. Students in dark blazer jackets and pale shirts ignore the birds as well. I wonder what is so absorbing as to make a metre wide bird, flying within an arm’s reach, invisible. More people seem to be paying attention to our parking than the birds. The birds leave and so do we. We drive down to the river, where an osprey nest sits on a dead tree and cyclists ride by without noticing. On the river there are swans, appropriate given its name, which look at me we one cautious eye. Parrots feed on the grass edges of the paths. A string of wetlands wind their way through Perth, the surface expression of an underground river. When the rains are heavy, the wetlands grow, only to shrink back again when the rains fail. Today they are wet and birds gather in large numbers. Cormorants sit in the waterside tree. A few Black Winged Stilts probe, fine beaked, at the soft mud. 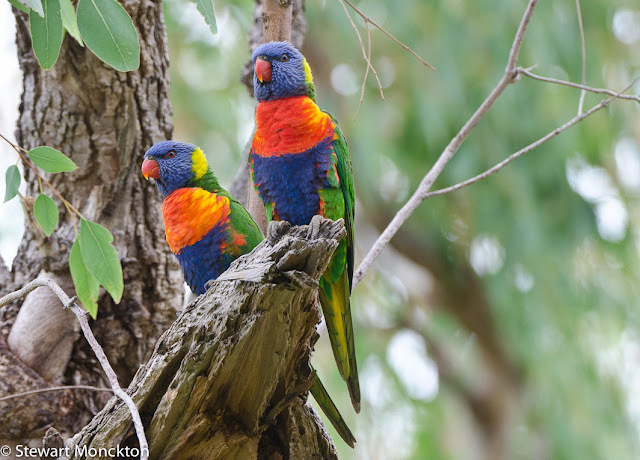 Rainbow Lorikeets, a bird introduced from the east, fly overhead calling loudly, pushing native birds from tree holes and nest sites. At one site, huge flocks of cormorants nervously fly run backwards and forwards over the water, their feet pounding the water, their wings grabbing at the air. It sounds like the faint applause of a bored concert crowd, clapping because it’s the right thing to do under the circumstances. We travel south (I think), hoping to outrun the light but persistent rain that was now falling. South (possibly) towards a set of new lakes formed in the damaged lands of industry. Nature is being given a helping hand here to mend the wounds of surgical extraction. Water, that great cure all, pools and stands and around it new trees grow. The ground underfoot is sticky with a black mud which gums to the soles of my shoes and ends up coating the carpet of the 4WD. A huge two-tone bird appears, fleetingly, over the low trees and my mind leaps to “Sea Eagle” – but I am totally, embarrassingly, wrong. Had I not see the bird again I would have sworn it was a bird of prey. It was a pelican, a bird that is almost impossible to misidentify. But I managed. I think back to how and why we name things, and how, when you look for rarity you often, mistakenly, find it. I jumped from one impression – a large two-tone bird – to a name in a heartbeat, and I got it wrong. There should be more to paying attention that a side-ways glimpse and a jumped to conclusion. The mud continues to stick to my feet, and I feel the need to scrape my shoes as I enter a small hide, the window ledges of which are placed at the ideal heights for hobbits or pro basketball players. A strange repetitive splash and whistle comes from a small bay off to our right. 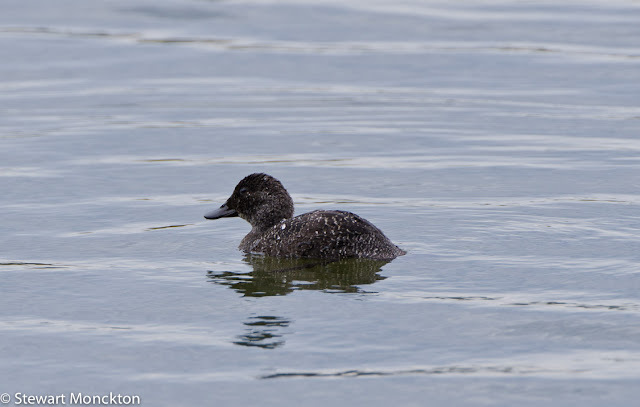 A male Musk Duck is displaying in a way that removes any doubt about his identity. 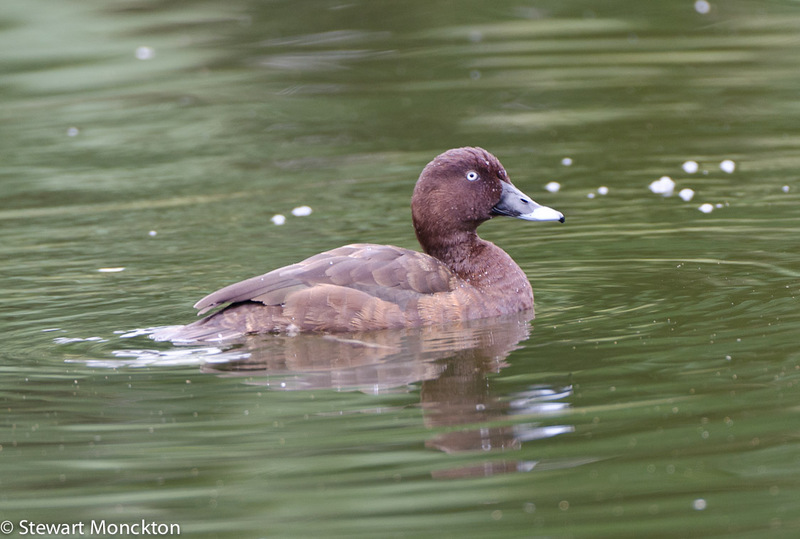 This already characteristic duck is trying to lure females to it in a way not really seen by any other duck. Already a bird that sits low in the water, it sinks even further and slaps the water behind it by flicking its legs backwards. On close observation this move seems to violate the constraints of avian anatomy. It looks like a move doomed to dislocate the legs of our love struck male. At more or less the same time as the feet slap the water, the bird gives off a high pitched squeaky whistle. Quite why this display attracts females eludes me, and on this day the female of the species was also overlooking its attractiveness. As we leave the hide the male is still splashing and whistling. Maybe he is just practicing. Eventually we point the car back towards the city, but a pair of lakes called The Spectacles pulls us off the freeway. Rather less than surprisingly these lakes are round and joined by a thin ribbon of wet vegetation. A network of gravel pathways leads away from the car park. The rain has settled the dust, and the path-side vegetation drips short showers of second hand rain. The lakes themselves are dry – and from the viewpoints you can only see where the water is meant to be, rather than water itself. It looks as if this last chance venue has little to offer, and we walk away. A bird perches on the very top of a tree – it’s not the right shape for a lorikeet, and it’s too fine for a rosella – I think of the pelican/eagle and take my time – just as I start to say “I think I’ve……..” it flies off with a dipping bobbing flight. It’s a Red-capped Parrot. A life bird. A few minutes later I get better views of one in the trees by the edge of the path. This time a good view and a short pause lets me make the correct call - and Stuart’s conformation helps as well! I think it’s a good way to end the day – a reminder that the challenges of naming birds can be overcome. And then the day’s end becomes even better. A small flock of birds land in the tree in front of me. They are fine, slight, birds, with a small head and long tail. “Elegant Parrot” says Stuart. I get one short, but clear look and the birds move off. The light from the cloud thick sky is failing. But the birds are clear enough for this one last naming. Slow down, take a breath, think. That’s what you need to do. As I pack up my camera and bins I wonder what the next day will bring. So many different birds and such beautiful pictures of them! "Even by Australian standards Perth is a long way from anywhere except Fremantle." LOL!!! You had a few good lines tucked away in here Stewart, but this one had me shaking. I love WA, but for very different reasons to the East. I am also wondering what the next blog holds....??? As always, I thoroughly enjoy your prose and of course the birds you met along the way. My son keeps telling me to get a monopod, much lighter than my tripod for his ageing mum to cart along. Hahaha, I've come to the conclusion that almost nothing about the world of birding is 'normal', so your comment about reducing the beauty of the bird to the sum of its parts that allow identification comes as no surprise!!! Quite a grouping of birds!!! Very different from what we've got here in California!!! Love that top shot...beautiful time of day, beautifully captured!!! Enjoyed reading about your birdwatching day. Liked the idea of a guide for the day. Having just been to Florida and been frustrated at seeing so many birds that I couldn't recognise, I realise that next time I'm there I need to find a local birdwatcher to accompany me on a walk. Always well worth the time in reading your longer words. 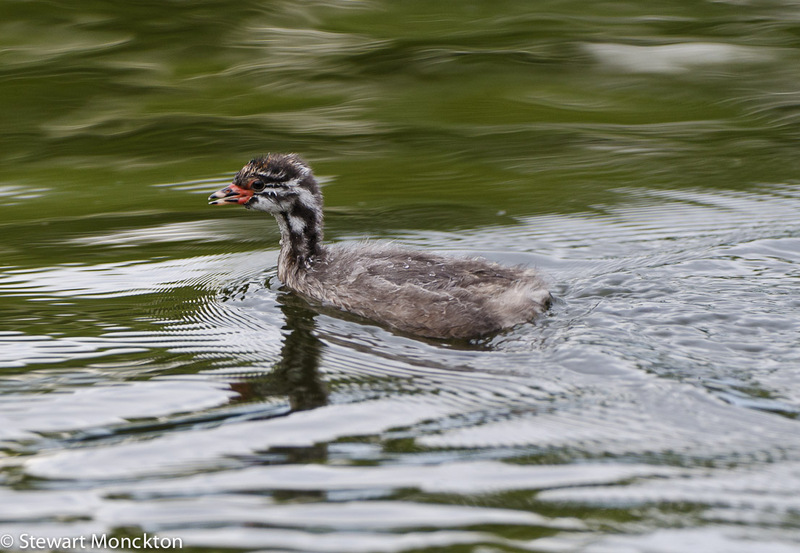 I thoroughly enjoy the squared-off beak of that dapper little Pink Eared duck. My passion of more specialty and knowledge in paying attention to is native wildflowers, particularly woodland wildflowers, rather than those out on the prairies. Though, either are wonderful, the woodland ones are harder to find, hidden, some rare, some alone, tucked into the most solitary places. This has been such a strange year for me, as usually I spend every day from the start of May onward, investigating & searching the forest floor for new growth and blooms. We are JUST getting our first marsh marigold blooms opening up.. they are not hard to come by, but cover large areas, and usually do so a month earlier. I'm curious what will happen, will everything bloom at once? Will some not bloom at all? Strange year. I'm ready & paying attention! Are you telling me Krispy Kreme made it to Australia? Enjoyed your little jaunt and search for birds. 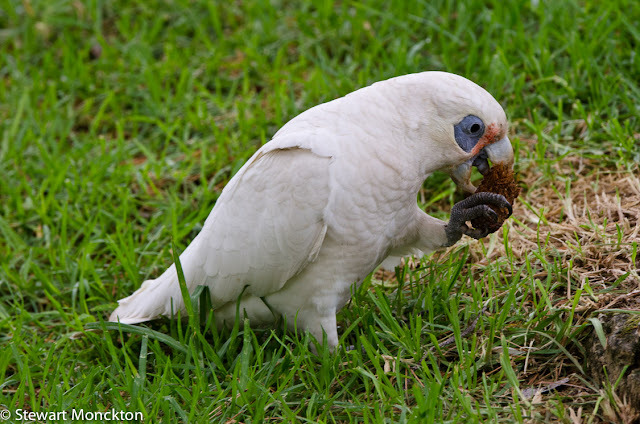 What a wonderful post Stewart!And all of different Australian birds!Very beautiful pictures! That first shot is so amazing!! I have a few WA friends on Facebook who I met via a Facebook birding group. They have lenses I am envious of and capture some incredible shots of birds that I have never seen before. One day I'd love to visit WA and see the many beautiful places & the birdlife. Another fine read with super photos Stewart. Like you I often wonder why Joe Public doesn't see, admire and show any interest in birds (or wildlife in general) but then console myself with the thought that I wouldn't enjoy it at all if there were too many participants. Beautiful photos! I discovered birds fairly recently. I then discovered that there are very few colorful birds in my part of the world.